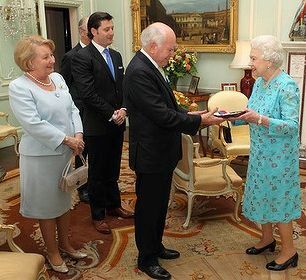 Former Australian Prime Minister John Howard has been presented with a rare and exclusive accolade from the Queen of Australia. During a meeting with the Monarch at Buckingham Palace, John Howard received the insignia of a member of the Order of Merit. Appointments to the Order are the Sovereign's personal gift and no ministerial advice is required. The Order is restricted to 24 members as well as additional foreign recipients. Appointments can only be made when a member dies. The Honourable John Howard O.M., A.C., S.S.I. and British artist David Hockney O.M., C.H., R.A., who was also appointed on 1st January 2012, take places left by the death of artist Lucian Michael Freud, OM, CH (8th December 1922 – 20th July 2011) and Dame Joan Alston Sutherland, OM, AC, DBE (7th November 1926 – 10th October 2010). John Howard: "It's a very nice honour and I feel particularly touched that I should have received it. I am touched by the personal compliment but I also see it very much as a mark of the Queen's great affection and esteem for Australia. "What I did, of course, I did as an Australian and as prime minister of the country. It was the greatest privilege anybody can have to be prime minister of Australia and I certainly see it very much as a mark of respect for our country." John Howard and ecologist Robert May, Baron May of Oxford, OM, AC, FRS (* 8th January 1938), an Australian scientist who has been Chief Scientific Adviser to the UK Government, are the only current Australian members of the Order, while opera singer Dame Joan Sutherland and Sir Sidney Robert Nolan OM, AC (22 April 1917 – 28 November 1992), one of Australia's best-known painters and printmakers, are among past recipients. John Howard was accompanied to Buckingham Palace by his wife Janette and youngest son Richard. Having already been appointed a Companion of the Order of Australia, and receiving the United States Presidential Medal of Freedom, protocol will see the latest honour take precedence on the chest of Australia's 25th prime minister.